Evan Carmichael is one of the most respected and prolific content creators on YouTube. His work ethic is unrivaled, cranking out and publishing 3 new videos per day. While his focus is centered around entrepreneurship, his videos could just as easily apply to and inspire someone pursuing a creative endeavor, an athletic challenge, or anyone just wanting more purpose and joy out of life. Gary Vaynerchuk, the standard bearer for entrepreneurial hustling and grinding, aptly described Evan as a video DJ mixing up and repackaging bits and samples of all the greatest and most inspirational video content that is out there. Evan takes these video clips from motivational titans like Les Brown, Tony Robbins, and Simon Sinek and distills them down to their most potent and impactful form, adding on top his own philosophies and key takeaways from the content. Being a proven entrepreneur himself, having built successful businesses prior to ascending in the content game, Evan is not just some curator of clips. Nor is he some hollow online persona peddling get rich quick schemes. Evan is the genuine article who has walked the walk and paid his dues. As important as any business credentials, Evan is heartfelt in his desire to want to change people’s lives. He wants to see everyone live purposeful, mission-driven lives and his one word governing philosophy is “Believe”. Even believes in each and every person that populates his robust and active community and he wants everyone to cultivate a belief in themselves as well. Evan has over 1.7 million subscribers to his YouTube channel and has amassed a staggering amount of videos that he has published over the years. To help you get started in consuming Evan’s work and to pay homage to the man himself we have compiled his 11 best videos from his wildly popular 10 Rules series. Evan has been somewhat of a virtual mentor to me. I have had the good luck and fortune to have shared some interactions online with Evan in the past. He helped coach me through some questions and challenges I had in regards to my pursuit of building out this content platform. Evan lives his values each and every day through his work ethic and his mission to empower people’s lives. I can personally attest to this having benefited from Evan’s selfless approach to helping others. 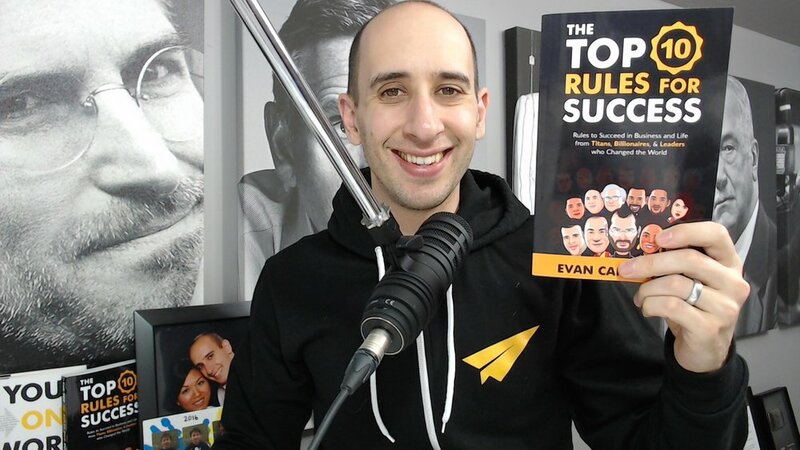 Evan’s teachings and philosophies are not just limited to video content, as he has also authored two books being Your One Word and The Top 10 Rules For Success. Each book brings a different purpose and approach to helping anyone who is either considering or already underway in an entrepreneurial endeavor. Your One Word is all about Evan’s homegrown philosophy of not only identifying your one word but how to embody and apply that word into everything you do in life. Your one word becomes your own governing principle driving each and every decision and action you make in working to grow your business. The Top 10 Rules For Success is a greatest hits feature, so to speak, compiling Evan’s wildly popular video series into a comprehensive book. Unlike most books, this book is suggested by Evan to be read in bits at a time with the goal of taking a concerted step of action each day based on the rules for success you had just read. I love this concept of reading a page or two, digesting the info, and most importantly taking immediate action. I am right now on my third pass back through re-reading the entire book again. The rules and philosophies from icons like Denzel Washington, Steve Jobs, and Joe Rogan never get old. Make sure you subscribe to Evan’s YouTube page and become an active member of his positive and supportive community. Joy is my one word and I am forever grateful for the direct impact that Evan had made on my life. Which video from our best of feature resonated most with you and why? Please leave a comment. We want to hear from you.